Here’s a tasty meal you can enjoy in minutes! Chinese five-spice powder, honey, and soy sauce create quite a glaze for this simple salmon dish. Broiling the green beans and salmon on the same baking sheet is genius and allows for faster kitchen cleanup. It’s an excellent meal to prepare for entertaining. As far as taste, the green beans were crisp yet tender, while the salmon had a rich, warm and spicy-sweet flavor from the exotic Chinese five-spice powder. Did I mention this dish was healthy? Salmon supposedly speeds up your metabolism and is loaded with lots of good Omega-3 fatty acids. 1. In a small bowl, whisk the honey, soy sauce, five-spice powder, and garlic. Put the salmon skin down on a large plate and pour the honey mixture over it. Flip the fillets so they are skin side up. Let the fish marinate for 15 minutes at room temperature. 2. Position a rack 6 inches from the broiler and heat the broiler on high. Line a rimmed baking sheet with foil and coat with cooking spray. 3. In a large bowl, toss the green beans with the canola and sesame oils. Arrange the beans on one half of the prepared baking sheet and season with salt and pepper. Arrange the salmon skin side down on the other half of the baking sheet. Brush the salmon with any remaining marinade from the plate. 4. 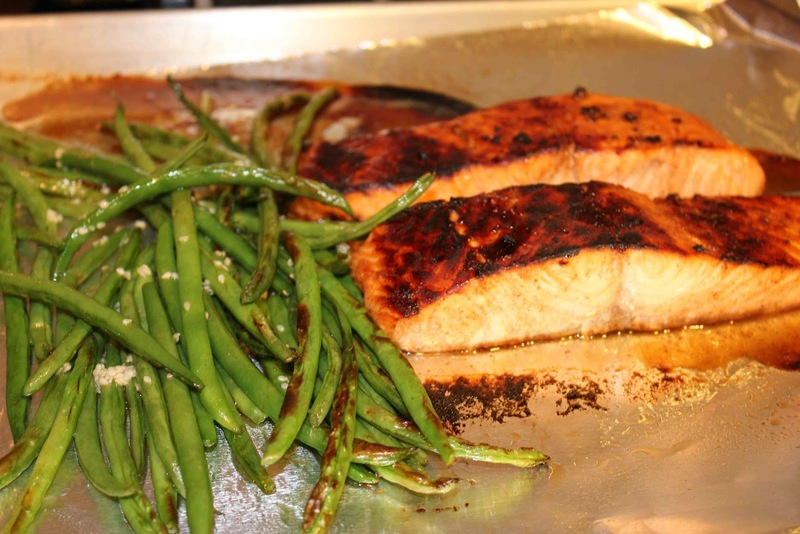 Broil the salmon and green beans for 3 minutes. Remove the pan from the oven, toss the green beans with tongs, and reposition the salmon pieces as needed so that they cook evenly. Continue to broil until the salmon is just cooked through and the beans are crisp-tender, 2-3 minutes. Toss the green beans with the sesame seeds and lemon juice and serve.